Let’s face it … the holidays are crazy! So much going on … parties, shopping, wrapping, decorating, entertaining, cooking & baking (well, not me, but I hear it’s a thing!). Great hosiery can make your legs look fab, along with providing smoothing and shaping. Anyone else looking for a little extra tummy control this time of year? Hanes Women’s Firm Control Power Shapers to the rescue! My legs look great and my tummy flat! What else does a busy fashionista need this time of year? How about Batiste Dry Shampoo ? This is one of my favorite beauty tricks. My hair tends to go flat and this perks it right up and even gives it a hint of color. NYX Matte Lipstick in Perfect Red is truly amazing for pure pigment and staying power. Not for the faint of heart … it packs a punch! Rimmel Lasting Finish Lipstick is a more well-rounded lipstick choice. I’m adoring my new Bordeaux shade right now. And last but not least, a little bling always adds a holiday sparkle to any outfit. 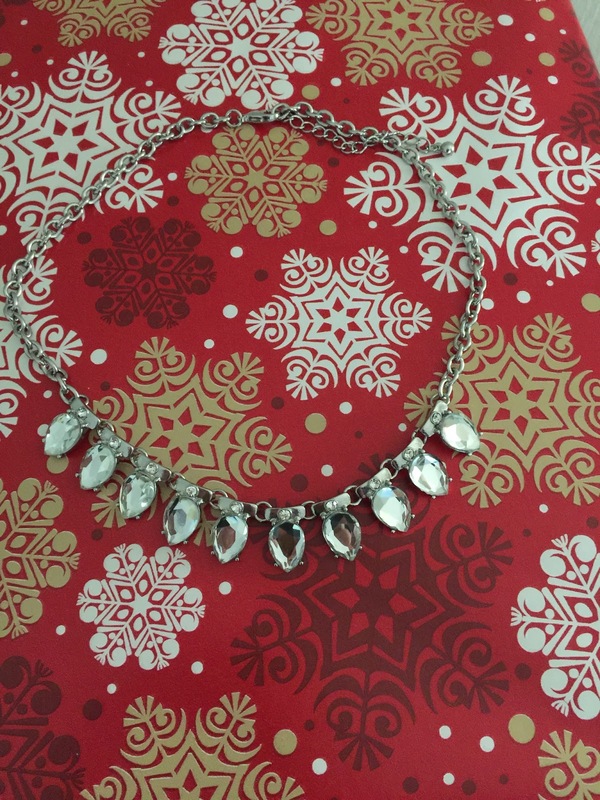 I found this pretty Crystal Bib Necklace at Nordstrom Rack for a bargain. It would even make a great last minute gift, right? And because money is always a little tighter during the holidays, all these suggestions are budget friendly too! Thank you to Hanes for kindly sponsoring this post. All opinions are all my own as always. Hope your holiday season is magical and amazing, Dolls! And don’t forget I’ll be hosting Fun Fashion Friday on Christmas Day and keeping the link up open for week. Stop by when you can! You are looking amazing for the holidays! Love that pretty top! You look amazing! I love that pretty necklace! I couldn't agree more…love your outfit, that necklace is adorable! Love your outfit and totally agree about the hanes hosiery!